Wikipedia defines arbitrage as the practice of taking advantage of a price difference between two or more markets and I’m amazed at how it’s helped the world of tech grow through the decades. Now before I continue I should point out productivity and flexibility are also crucial reasons for tech growth. For example, the PC spreadsheet made it possible to not only perform financial calculations more quickly but more importantly to perform calculations you just couldn’t afford to have humans do. But really, arbitrage is the hidden gem in the market because quite often it fuels the use of a new technology with paying customers who can justify the expense because they are saving money elsewhere. As TMC's Peter Bernstein says, the rule of threes seems to be in effect. First we lost Steve Jobs who transformed the music, movie, computer and mobile markets and next we lost C programming language and UNIX OS creator Dennis Ritchie. The third death was that of Former Motorola CEO Robert Galvin who oversaw the creation of the first "large-screen" (19-inch), transistorized, cordless portable television and the first cell phone among a slew of other important innovations. As I mentioned yesterday, the C programming language was the fourth one I learned after BASIC, Pascal and PL/1 and what made it unique was its infinite flexibility. All of a sudden a programmer could create dynamic arrays of pointers in a program instead of relying on fixed variables. Should We Define 4G Before the Government Does? Every few years the American people elect politicians who say one thing to get elected and do another once in office. Conflicts of interest, scandals related to campaign contributors, tax evasion and other related issues have made us numb and political ethics is a phrase you may have just read now for the first time. But of course politicians being politicians need to help the people - at least that is what they say they want to do. One of the latest focus areas is 4G - what exactly is it? My company TMC runs a show on 4G called 4GWE (Feb 1-3, 2012 in Miami) so this topic is of great importance to me. Today, Rep. Anna G. Eshoo (D-Palo Alto), top Democrat on the U.S.
iOS 5 Update: Steve Jobs Rolling Over Already? I understand the title of this post may be insensitive and nothing could be further from the goal of this piece. In fact, if anything, I admire Steve Jobs so much that I feel this entry needed to be made in order to honor his memory. The question which our industry is asking today is how could Apple screw up the iOS 5 update so badly - literally a week or so after the death of Steve Jobs? I realize of course the two incidents aren't related but one has to wonder if all those devices that Steve keeps in his office wouldn't have have had a hiccup or two - causing him to sound the alarm bells that this upgrade was not ready. 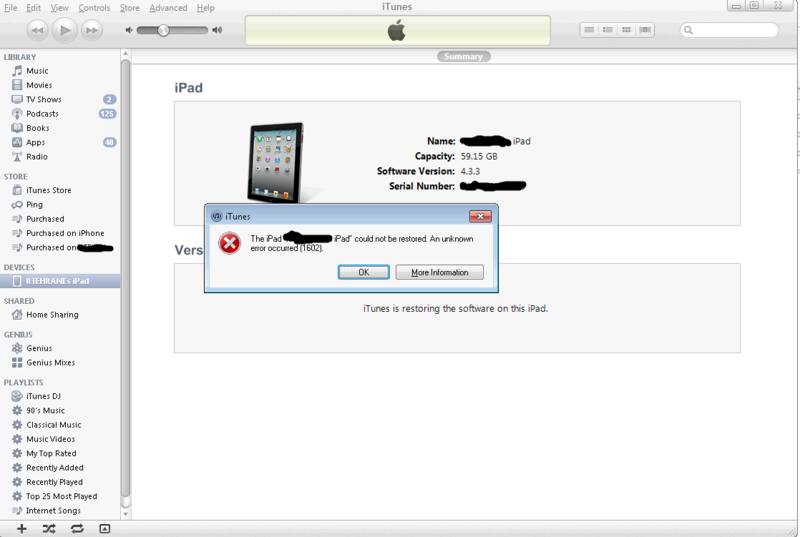 As I mentioned earlier today - I went into the upgrade cautiously and an iPhone 4 was upgraded without a hitch but an iPad 2 crashed, giving me the error message below. I sent an email to my IT team and they suggested rebooting and retrying - apparently there are cases where an upgrade had to be performed four times to get it to work. We know that texting while driving is dangerous but new research shows it may be even more of a concern than researchers previously thought. How bad you ask? Well according to an article by TMCnet's Jamie Epstein you are 11 times more likely to blow a flashing yellow light if you are texting what you had for breakfast. On a side note, this is an even bigger problem for Yours Truly who enjoys a big breakfast with lots of ingredients. The good news here for Apple - the company's new Siri software should help bring awareness to speech recognition as a viable alternative to life-threatening e-mail while driving. Kikin: Did Web Links Just Become Less Important? A new iPad browser from Kikin (iPad link) allows you to click on text to draw a circle around it- then it performs a web search in a window and pops up results allowing you to open the results in the foreground or background. By seeing a few of the top results and a snippet of each result beneath the web links, you can quickly get a feel for the most important and/or latest news about any topic located on your web page. So as a writer, I wonder if I need to add as many web links - assuming of course that this browser and model for browsing becomes popular. I tried the browser with a bunch of sites like CNN and the Drudge Report and it worked well in most every case - detecting the important word in the center of the circle and eliminating extraneous search terms. I wasn't able to get it to work correctly with TMCnet for some reason. Should this be Apple's New Logo? Glenn Beck’s recent launch of GBTV for example shows us how a content provider can take his or her show and produce it just fine without the need to deal with traditional distribution. But from the standpoint of the consumer, having access to a smattering of programs on disparate websites is not the same as accessing them all seamlessly through a single aggregator. Will any margin remain in selling standalone computing hardware? I want to bet against Amazon - not because I don't like the company - I most certainly do. But because coming out with a new line of tablets to take on Apple is not turning into a successful strategy for the rest of the tech world. Both HP and RIM are feeling pain - even though I might add the Blackberry Playbook is a very solid tablet. When Amazon released a slew of devices today from $79-$199 I was concerned that this is yet another case of a tech company going up against Apple and getting slaughtered. It is worth pointing out however that the HP tablet didn't really start selling until the price was dropped to $99. But back to Amazon - I didn't think the original Kindle would be very popular and I was wrong.